Julie thoroughly enjoys public speaking and in April 2016 she had the opportunity to give a TedX talk at Xavier University. The theme of the event was "Decoding Deception," and Julie's talk was entitled, "Blend to Stand Out." Julie Pugh spent her childhood on the family farm outside Kokomo, IN. It was a working farm where they raised corn, soybeans and tomatoes. Every other week, they’d load a tractor-trailer with hogs to take to market. She was the first girl born on her father’s side in 21 years to the day. She had nine cousins who were boys her age and older. She played football in the mud and went to monster truck rallies with her father. Her parents signed her up for every sport they could find, just to keep her occupied. Basketball, soccer, softball, tennis, track, volleyball, wakeboarding, waterskiing. She was nine when she learned to slalom. Through high school, she was never not engaged in a sport. She was second in the state in tennis doubles her senior year. The same year playing basketball, she sustained multiple injuries, including sprained ankles, dislocated thumbs, a black eye, and minor concussions. She was not shy about going after the ball. Julie has little patience for excuse makers. “People amaze me with the things they come up with in order to avoid accepting responsibility.” She admires those who are somehow impaired but who rise above adversity and succeed. She believes we each have an obligation to make the most of whatever we have. Julie's two boys, Austin and Caleb, keep her running at home. "It's amazing, and sometimes frightening, to see your personal traits and attributes in the little body of your child. It reminds me to be my best self at all times possible." To that end, Julie has supported and volunteered with the Character Council, an organization committed to promoting good character to develop a stronger, safer and more unified community. She hopes to help instill good character in her children, and to spread the message that a positive attitude breeds success. She also sits on the board at Cancer Family Care and serves as an Executive Committee Member of the local SHRM Chapter, the Greater Cincinnati Human Resources Association (GCHRA). Julie’s practice focuses on client counseling, employment litigation, and dispute resolution. She routinely represents clients before the EEOC, OCRC, DOL, and federal and state judges. 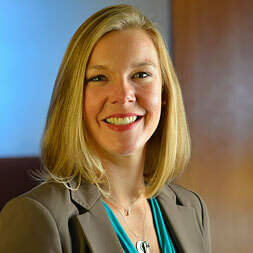 Julie’s typical day starts with her reading about the latest changes in labor and employment law. The rest of the day may include quickly responding to client phone calls and emails, researching nuances of employment law, drafting and interpreting employment-related agreements, negotiating various contracts, asking a court or administrative agency to rule in a client’s favor, reviewing policies and employee handbooks, and hopefully making others’ jobs a little easier. Julie also regularly visits client locations to counsel human resources staff, managers and supervisors, and employees on important legal topics. Examples of such training topics include wage and hour laws, anti-discrimination and anti-harassment (or “Respectful Workplace Training”), labor relations, and leaves of absence management. Julie and her husband, Jeff Pugh, are residents of Delhi. Jeff is the Admissions Director at St. Xavier High School, and they spend lots of time chasing after their two sons, Austin and Caleb. If you need a smile, ask her to see a family picture!